Washington’s Kassidy Hines (left) and Halli Wall go for the ball during a rebounding drill at practice Monday, Feb. 26, 2018, preparing for Wednesday’s District championship game against Sheridan. Washington head coach Samantha Leach, at right, has her team practice taking contact on their way to the basket during drills at practice for the Division II District championship game against Sheridan. With the ball is Shawna Conger. 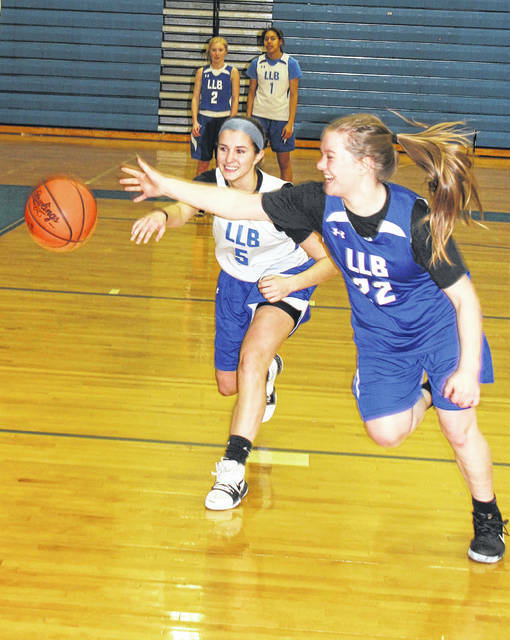 Few teams in the history of the program have advanced as far as this year’s Lady Blue Lion basketball team. In fact, it was been 27 years since the Washington girls won their first and still only (so far) District championship, that coming back in 1991. This year the Lady Lions, now 22-3, have the most wins in a season in program history and will go for just their second coveted District championship Wednesday at 7 p.m. at Southeastern High School against a formidable Sheridan Generals team (20-3). The Generals lost two games to start the season, 52-49 to Franklin and 60-49 to Maysville before rolling to 10 wins in a row. The Generals lost to Tri-Valley 51-42 on Jan. 20. They are currently on a second 10-game winning streak with three wins in the tournament (62-26 over Athens, 49-38 over Warren and 42-29 over Miami Trace. Sheridan has won three District championships in girls basketball, most recently in 2005. The Lady Lions won their first seven games of the season before a 53-41 loss to Miami Trace on Dec. 23. Washington then won its next nine games before losing 55-53 to North Adams on Jan. 29. They won three more before a 45-34 loss to Miami Trace on Feb. 10. In the tournament, Washington defeated Hillsboro, 69-31, Unioto, 54-51 and Vinton County, 69-53. “I’ve had a chance to see Sheridan play in person once,” Washington second year head coach Samantha Leach said. “I’ve watched some film on them, as well. “They have a point guard who is very good,” Leach said, referring to sophomore Kendyl Mick. “She’s very physical, she likes to attack. She can shoot from the outside. A lot of the players feed off of her. She’s one of their leaders. “They also have a post player (Rachel Cooke, a six-foot junior) who loves to shoot the three,” Leach said. “She likes to play out on the perimeter. Those are their two best players. That’s who they feed off of. Especially toward the end of games, one of those two girls is going to be taking the shot. Sheridan is averaging 58.8 points per game offensively and has allowed an average of 39.4 points per game this season. The Lady Lions are averaging 55 points per game and allowing an average of 39.7 points per game. “Miami Trace did not shoot the ball very well against Sheridan,” Leach said. “I do think some of that had to do with Sheridan. They are very sound, defensively. They protect the paint very well. They are very physical. They make you do a lot of things that you’re not used to, or that you don’t want to do. They can get you out of your comfort zone, offensively. Essentially the same group of players won 11 games for Washington last year. This year, the win total is 22 and counting. Leach discussed the growth of her team. “I’m just very impressed with the amount of growth we’ve had from last year to this year,” Leach said. “I just think it says a lot about these kids and the amount of time they’ve put in over the summer and even during the preseason and during the season. They’ve stayed committed and just stayed true to what we are trying to do here with our program. “They work so hard and put forth so much effort into it,” Leach said. “It’s a big deal for our community and our school. It’s been since 1991-92 since we’ve won a District championship. I think the girls realize it’s a big deal. They’ve done a really good job of keeping their composure, especially in the last game, competing for 32 minutes. That’s something we’ve talked about and something that we definitely have to do on Wednesday. The Lady Lions always have a good following and Leach and her players certainly know that and appreciate folks coming out to cheer them on. “We appreciate the support and all the fans in the community following the girls,” Leach said. “It makes a huge difference for the atmosphere, just everyone coming to the game and cheering us on and supporting us. It gives the girls more motivation and an opportunity to feed off of our crowd. We appreciate it so much. 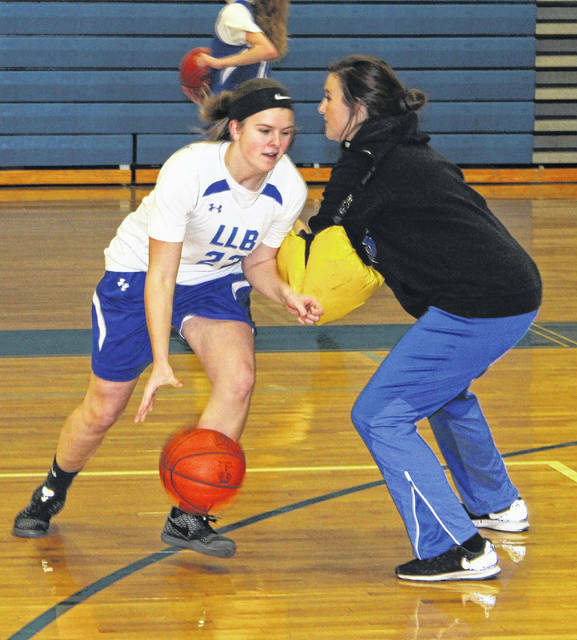 “The biggest thing with me as a coach is just the amount of growth that I’ve seen with the girls,” Leach said. “Including their skill level, but physically, as well, their conditioning, to mentally and how they play the game and how they handle certain situations. I just feel like, as individuals, they have grown so much. This year, we have grown even stronger as a team. Tickets: If you haven’t purchased tickets yet, stop by the high school today. Tickets are $6 each and the school gets to keep 25 percent of proceeds from the tickets it sells.